Religion and culture are just two of the closely-related matters in this world but are actually different in nature and definition. There have been several theories suggesting the connection of the two such as religion being the center of culture. However, we can never deny the fact that certain cultures can also be disconnected from any form of religion in a society. This article will give a glimpse on their individual definitions and their major differences. Read on and take some notes, if you will. Religion is the relationship of every individual to the spiritual things they have regarded as holy and worthy of their highest reverence. It is also considered as the means that brings comfort to the people whenever they deal with the truth of life and death and anything in between. Many of the religions in the world highly observe their sacred texts as the authority and guide for spiritual and moral conducts. Most concerns known as prayers of religious people are directed to the gods and spirits they believe in. They perform in religious activities such as meditations and rituals mostly done in institutions also participated by other believers and worshipers. Because of this, religion has become the backbone of most people in every society even at the onset of those times when animism was prevalent. Religion helps people understand the natural calamities happening around them. This concept somehow provides them with explanations on phenomenons such as flood, earthquake and the likes. The system of moral and ethical values of people are also based on the religion they’ve been practicing in a society. Religion, in other words, makes sense of the events in every person or believer’s life. It has always been fundamental in the religious view to worship and serve God or in the case of other religions, in many gods. Things that pass the moral standards of religion are accepted while those that are not are considered immoral which religious people don’t want to associate with. Religions have back stories that are sacred and these tidbits of history are preserved in scriptures, representations and sanctuaries. People who believe in religion are usually called religionists. There are also people who follow not just one but more than one religion at a certain time. Three of the world religions that have the most number of followers are Christianity, Islam and Hinduism. Culture doesn’t really have a universal definition but most people have agreed that it refers to the collective knowledge existing in the people of a society. According to Cristina De Rossi, an anthropologist at Barnet and Southgate College in London, culture shares its word history with the French word also termed culture derived from the Latin term colere which means “to nurture the earth”, and other words with meanings related to the cultivation of growth. Culture is the social heritage of every person which includes the knowledge they have acquired from years of being together in one particular society. When one fully comprehends the concept of culture, he or she can easily determine why people in one area behave in a certain way that they always do. People usually ask why a certain society dresses up this way, speaks that way, believe and practice this or that. Culture definitely answers all these in a perfect sense. 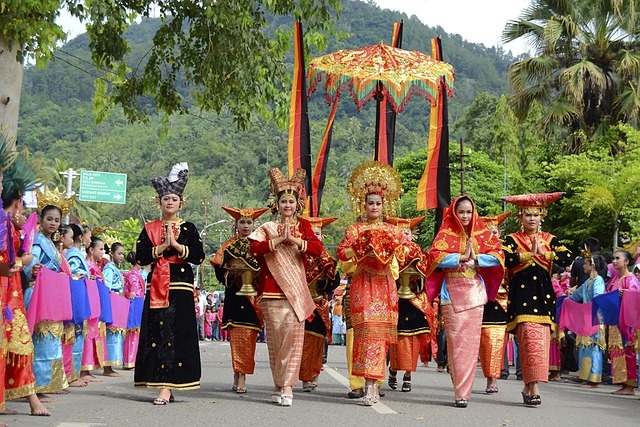 The reason why people exhibit particular traditions and customs in their community is because of culture that is their shared knowledge. When it comes to the material aspect of culture, the people’s mechanisms and relics are also included as these things reflect what their culture really is in a given society. To add to the list of things that mirror culture are the people’s language, architecture, clothing, greetings or interactions with other, eating habits and other traditions. In other words, culture hints us on how these people refine themselves to perfection through the passing years. However, the things mentioned earlier are just the physical part of a certain culture. What really is closer to the cultural view of humanity is how the people become aware of themselves. This knowledge is acquired and not just a genetic result that develops at birth. This means that every person in a society establishes familiarity with the happenings around him and eventually develops it into tradition. That is what constitutes culture which includes religion as one of its many subsets. Confused as some people may be in their characteristics but, the reality is religion is just one of the many subsets of culture and not the other way around. Culture is the bigger picture. Culture is a body of knowledge that is acquired by people through years of being together in one society, while religion is the belief system directed towards the supreme deity and yet this is something that may or may not be accepted by each person in a culture. Two individuals may have the same culture and yet practice different religious practices. Culture focuses on the human beings which is its social heritage, while religion is associated with the God or the Creator of the whole universe. Culture is concerned with the evolution of humans and their beliefs and practices. On the other hand, religion is wholly concerned with revelation that comes from the Supreme Being to the people. The existence of religion is formally written in holy scriptures that came from God; while culture is more practical as the way people behave in a community shows what kind of culture they have. Culture tends to change as time passes by while the fundamentals of religion is fixed from the start. To summarize all the things discussed in this article, it is easier to illustrate that religion can be likened to a manuscript while culture is to the amendments when the manuscript is being kept. Julian Angelo. "Difference Between Religion and Culture." DifferenceBetween.net. March 13, 2018 < http://www.differencebetween.net/miscellaneous/religion-miscellaneous/difference-between-religion-and-culture/ >. I am so glad i found this write up as Ihad a hard time finding a book that speaks so clearly on culture and religion in their distinct features. May God bless the writer. 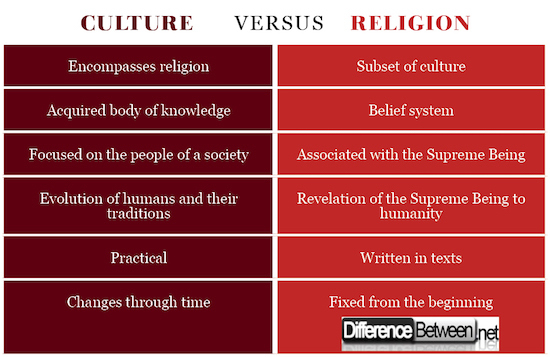 “Difference Between Culture and Religion”. DifferenceBetween.com. 2012 July 8. Web. The Editors of Encyclopedia Britannica. “Religion”. Britannica.com. Encylopedia Britannica. 2000 January 6. Web.